9/23/2009Share this story on Facebook! 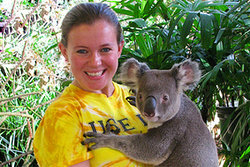 One of my favorite moments in Sydney was when I got to cuddle a koala at a reserve in Cairns. Australia is one of the most beautiful countries in the world, but it is also home to some of the deadliest creatures on earth. Box Jellyfish: These jellyfish are peaceful and would never attack a human—but beware of bumping into them. One sting from a “box jelly” and you could suffer respiratory paralysis. The Taipan: The third most poisonous snake in the world. A drop of its venom is enough to kill 12,000 guinea pigs. Funnel Web Spider: Often found in metropolitan Sydney (where I lived! ), this spider has killed at least 13 people. Blue-Ringed Octopus: Don’t let its good looks fool you. These guys contain enough venom in their relatively small body to kill 10 humans. Check out Ithaca's study-abroad programs! 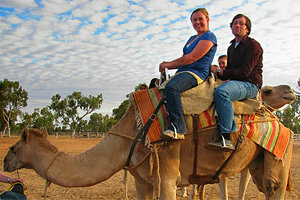 Fellow IC student Dan Ophardt '09 and I rode a camel to dinner during our trip to the Australian Outback. On the surface, Australia is, arguably, similar to the United States. Both are divided into states, are English-speaking, and share a lot of cultural similarities like movies, music, and food. But it’s not all as it seems. College life has its differences, too. First of all, a “college” is a residential establishment, a cross between a U.S. dorm and a fraternity house. And it’s not even called college; it’s “uni,” short for university. 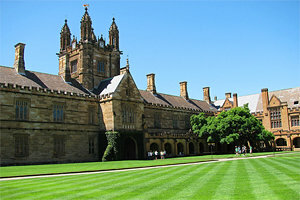 Unlike in the U.S. where students select their own classes and class times, Australian uni students do not. Your class schedule, known as your timetable, is computer generated. Once the computer has selected your classes, you can view and print your timetable only once. If you view it again, it regenerates and shuffles you into different class sections and times. While this can be frustrating, and initially seems to offer less freedom, there is one plus side to this crazy system -- you’re allowed to choose a day off during the week. I chose Friday, allowing myself to spend the day at Coogee or Bondi Beach every week for the first two months of the semester. Grading, or marks, presented a difficult adjustment for me as well. Grades are significantly lower than they would be at home. Needless to say, I was quite surprised to get a 70 percent on a paper and have the teacher say “good job.” That’s because a 70 percent is considered a good grade by Australian standards! It will earn you a B+ on an American scale. Here in Australia, students attend uni for only three years, but they take nearly all of their classes within their degree of study. All of the classes I took in Australia fulfilled my liberal arts requirements beyond my major. This gave me the chance to experience classes I would never have gotten to take at IC, including Australian literature, Australian theatre and film, Australian politics, and Australian popular culture. I've seen more amazing things than many people see in a lifetime, and I'm only 21. These classes helped me to learn a lot about my new home, one of the most important aspects of studying abroad. For my Australian Theatre, Film, and Learning class, we attended three live theatre performances in and around Sydney. We also got to take a backstage tour of the Sydney Opera House! During my last week in Australia I went to Cairns, snorkeling at the Great Barrier Reef, and trekking through the world’s oldest rainforest, the Daintree. 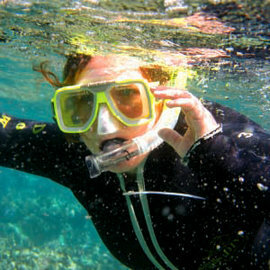 I saw stingrays, turtles, and swam among schools of brightly colored tropical fish, all of which inhabit one of the Seven Wonders of the World. I’ve never seen water so clear, or experienced such a rush! I can’t imagine a better week, or a better way to end my study abroad experience. I learned so much about myself during my semester abroad, including how independent I can be and how I can overcome personal challenges. Whether it’s conquering my fear of heights climbing a 90-degree incline on a glacier in New Zealand, sleeping near scorpions in the Outback, riding on a camel, or standing up on a surfboard for the first time, I developed a new kind of confidence that I didn’t have before. I’ve seen more amazing things than many people see in a lifetime, and I’m only 21. While my semester in Australia has been one of the best experiences of my life, I was also really excited to come home. I urge every student to take advantage of this great opportunity and go abroad. Looks like i will be doing the opposite to you Meghan by coming from Australia to spend a semester at ithaca.